A-HOTEL.com - Luxury and cheap accommodation in Jūrmala, Latvia. Prices and hotel, apartment booking in Jūrmala and surrounding. This indicative offer was derived from the most recently booked accommodation in Jūrmala and sort by the price, from cheapest Jūrmala accommodation to the most expensive hotels. To select accommodation by your preferences we recommend to choose from 109 accommodation offers in Jūrmala in total. By entering the dates of your overnight stay in Jūrmala and using the filter tools you can sort the best possible accommodation for you. The entered dates of your stay are crucial for the most accurate offer as it derives all the online information on pricing and availability of Jūrmala accommodation. Then you can book the selected Jūrmala lodging (hotels, apartments etc.) immediately. Set in Jūrmala, Bulduri Beach Apartments offers accommodation with seating area. Free WiFi is offered. Katrin Apartments is located in Jūrmala and offers self-catering accommodation with free WiFi access. The property is only 500 metres from the beach, about 1 km from the Livu Aqua Park and 3 km from Dzintari Concert Hall. Baltic Beach Hotel & SPA is located in the heart of Jurmala, just 200 m from the central Jomas Street and has direct access to a private, sandy beach. The hotel features an indoor sea water swimming pool, a private park, a children’s playground, free WiFi and free parking. Renovated in 2016, Lielupe Hotel SPA & Conferences by Semarah is located in a calm area of Jurmala, surrounded by forest and 400 metres from the Baltic Sea. It features a spacious kids club with different games and toys. Located in the heart of Jurmala, 350 metres from the beach, Villa Alvīne offers spacious and bright air-conditioned apartments with free Wi-Fi decorated in classical style. The apartments have a kitchen with a dishwasher and an electric kettle. Located in Jūrmala, near Orthodox Church in Dubulti and Dubulti Lutheran Church, Jurmala Lux Apartments - SeaFront features free WiFi, and guests can enjoy a garden and a terrace. Accommodation is fitted with air conditioning and features a flat-screen TV, a fully equipped kitchen with a dining area, and a private bathroom with free toiletries. Offering an award winning restaurant, the modern and elegant Boutique Hotel Mama is located in centre of Jurmala, near the beach and river. 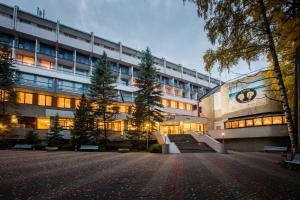 The hotel occupies a restored building in the wooden architectural style characteristic of Jurmala. Offering a garden and heated floors, Gamayun is located in the resort town of Jūrmala, 15 minutes' walk from the Baltic Sea. Free WiFi access is available in this holiday home. This modern and elegant boutique hotel combines personal service, stylish rooms, fine dining and luxurious spa treatments with an excellent location only 400 metres from the sea and surrounded by pine forest. The Amber Spa offers cosy and quiet rooms and suites with up to 3 bedrooms, ranging from 40 to 70 m². Vienibas prospekts 6 has well-equipped accommodation boasting free WiFi in Jūrmala, 900 metres from Livu Aqua Park. A sauna is offered at surcharge. Boutique Hotel Light House Jurmala is offering accommodation in Jūrmala. 700 metres from Dzintari Concert Hall, the property features a private beach area, as well as a terrace. Located in the Baltic resort of Jūrmala, Eiropa belongs to the hotel chain Good Stay and offers accommodation in two buildings only 100 metres from the beach. It features rooms and suites with satellite TV and free Wi-Fi. Located in the centre of Jūrmala, 20 metres from the Dzintari Concert Hall and only a short walk from the beach, Pegasa Pils Spa Hotel offers air-conditioned rooms with a minibar, free Wi-Fi and free parking. The Pegasa Pils’s rooms all feature a interior décor inspired by Art Deco. Located in Jūrmala and within 2.7 km of Dzintari Concert Hall, Sea Breathe has a seasonal outdoor swimming pool, rooms, and free WiFi. Located in Jūrmala, Kurshi Hotel & Spa is 400 metres from the sea. There is a spa centre, offering body and face treatments and massages, manicure and pedicure, Sharko shower, steam bath and a sauna. The newly renovated Dzintars Hotel is located only a 10-minute walk from the beach and offers elegant rooms with free Wi-Fi and private bathroom facilities. The property was built in 1912 and includes free parking.